Bangles, cuffs, or kadas are one of the most coveted forms of jewellery, given the variety and options that are available. Thin stackable bangles or thick statement cuffs, there are innumerable ways to dress up or dress down an ensemble. Ahilya focuses on creating beautiful handcrafted sterling silver bangles, cuffs, kadas and bracelets in both heritage and contemporary designs. Our designs draw inspiration from different regions in India and they are an amalgamation of antique, vintage designs re-worked to suit modern tastes. All Ahilya pieces are made with Sterling Silver that may be gold or rose gold plated (depending on the design) and embellished with precious and semi-precious stones like diamonds, sapphires, pearls, onyx, turquoise, rubelites, lapis lazuli, tourmaline, jade, mother of pearl etc. We love oxidized pieces which are consistent in most of our traditional designs. Each piece is individually Hallmarked with a BIS-Hallmarking certificate guaranteeing 92.5 % silver. Our wristwear especially is unique in that our pieces are intricately engraved and created with absolute finesse. Our unique designs span across various collections and suit every occasion. The Imperial Filigree Collection has influences from the east with beautiful and intricate cutwork cuffs, while our Dakshin Collection has Temple inspired engraving. Our Handpainted Collection and Coin collection are specific to just that, handpainted bracelets and bracelets made of antique coins. And lastly, our Zen Collection has beautiful, minimal cuffs and bangles made in Sterling Silver that are so great to stack or wear as is. We also have the Statement Collection that includes beautiful cuffs and kadas with tribal etchings, vintage designs, and contemporary finishing. 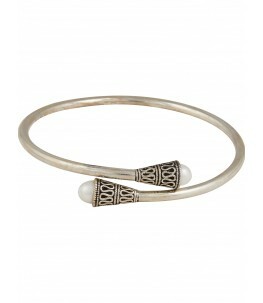 Antique silver Kadas and Cuffs – We love vintage bangles and cuffs with oxidized finishing. Right from animal motifs to bird motifs - elephant , makara ( a mythical animal believed to give good luck ), peacock, tortoise, snake, to floral and foliate designs - we have rose motif , these pieces take you back to the old world charm, and are one-of-a-kind and unusual. Contemporary Sterling Silver Bangles and Cuffs – Our contemporary wristwear has minimal designs as well as bohemian styles with delicate tribal etchings. Our modern pieces are extremely unique with clean designs that are wonderfully lightweight. 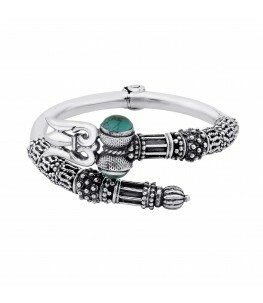 Sterling Silver Bracelets – We have beautiful antique bracelets with miniature hand paintings and vintage guinea coins that look ethnic and rustic and are absolutely versatile. 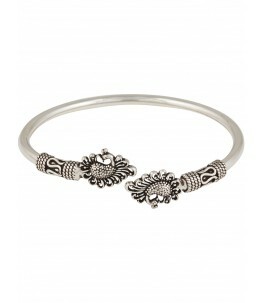 Traditional Bangles and Statement cuffs – For those looking for something more traditional, we have a variety of options. From the lovely Gokhru kada, to the statement Pacheli, to beautifully made Gajredaar bracelet kadas, you are bound to find something you love. Engraved Silver Bangles and Cuffs – We have beautiful intricately engraved bangles and cuffs with influences from South Indian Temple jewellery as well as Rajasthani and Jaipur Jewellery. 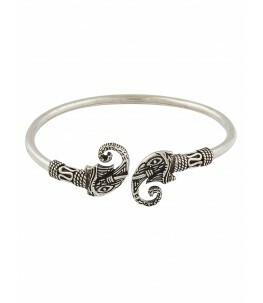 Unisex kadas – We have a variety of unisex sterling silver kadas that can be worn by men and women alike. With beautiful engraving and encrusted with semi- precious stones of your choice, the options are endless.